cauliflower provides such beautiful benefits for the human body, so i try to include it in our meals at least once a week. i love it most any way ~ raw, roasted, plain, spiced, herbed, riced, stewed, etc. it is one of my absolute favorite cruciferious vegetable, and you essentially can't "mess" up any way you choose to prepare it. 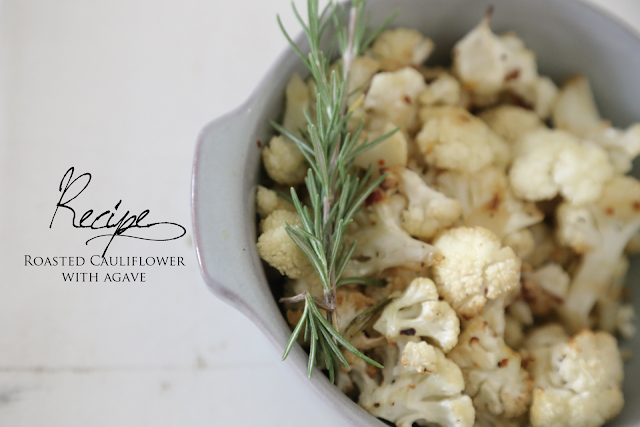 this is one of my favorite ways to make cauliflower, as it is simple, makes your house smell heavenly, and gets you in the mood to put on your favorite sweater and do all things autumn. preheat your oven to the broil setting on high. line a baking sheet with parchment paper. cut the cauliflower in half, removing the stem and leaves (i absolutely love eating the stem raw, and the leaves are actually edible too) leaving only the florets. you can cut these in half if you prefer, or leave them as they are. in a colander, rinse the florets and pat dry. in a medium bowl, combine the florets, agave, olive oil, minced garlic and salt and pepper together using either your hands or utensil. next, add a sprinkle of red pepper flakes and the rosemary. let the flavors "marry" for about ten minutes. next, transfer cauliflower to the lined baking dish, making sure all florets are evenly spaced and broil for around 15-20 minutes, or until cauliflower is slightly browned (not burnt). enjoy on their own or as a side dish. I absolutely love cauliflower! I like it every single way! I must try this! Tonight!